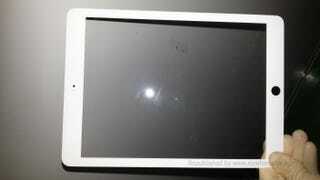 Since the launch of the iPad mini, there's been some speculation that the next full-size iPad might ape its looks. Today, French site Nowhere Else has published an image of what it claims to be the bezel of the next iPad—which does indeed look a little like the mini's. While it's certainly worth taking a rather large pinch of salt along with the picture, it's worth pointing out that Nowhere Else does have previous good form when it comes to Apple rumors—correctly spotting the Lightning connector and the iPhone's nano-SIM cradle in the past.